The Cerant/Love House is artist Alexandra Grant’s proposal to transform the Cerants’ home on E. 107th Street. Grant, Roberto Sheinberg, Arnold Swanborn and residents Moneik Johnson and Louis Cerant have created a masterful renovation plan that adds value to both the public space as well as interior family life. 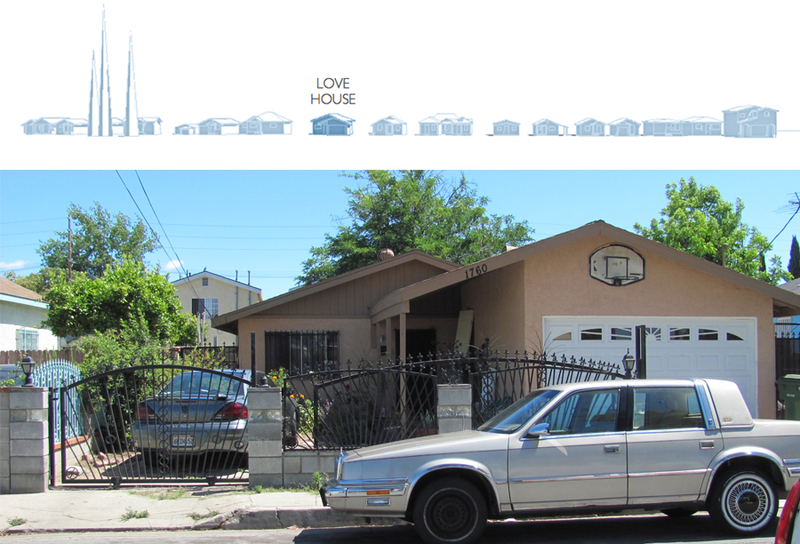 The Love House is an important piece in the larger design of WHP. With a title that connotes unison and affection, the Love sign can be understood as a symbol of WHP’s principal objective, which is to significantly improve the quality of life for families by families using art and architecture as a catalyst. Husband and wife Louis Cerant and Moneik Johnson are the foundation of the Cerant family household on E. 107th Street. Known in the neighborhood for their generosity and open hearts, the Cerants did not think twice to open their door to Louis’ relatives in Haiti, when the earthquake struck in 2010 and left them homeless. But in their small three-bedroom home, the Cerants struggle to provide to provide for their extended family of ten people (6 children, two grandmothers, and two parents, Moneik and Louis). A founding partner of SW + SH architecture in Los Angeles, Roberto Sheinberg has practiced for over 15 years in Mexico and the US. Throughout his career he has focused on creating contemporary, inspiring and environmentally appropriate designs. His diverse body of work includes institutional, commercial projects and multi-family and single-family housing. Prior to SW + SH, Mr. Sheinberg worked with Tanner Leddy Maytum Stacy Architects and spent the last five years as Senior Associate at Leddy Maytum Stacy Architects (LMS) in San Francisco. Before relocating to California, Mr. Sheinberg formed his on practice and worked in his native Mexico City for TEN Arquitectos with Enrique Norten. His work has received numerous local, state, national and international design awards and has been exhibited in Spain, Mexico, US, Japan, Finland and Brazil. He has been published extensively in the US, Mexico and Europe, in magazines such as Architectural Record, Enlace, Metropolitan Home, and Hauser and in books by Princeton Architectural Press, Monacelli Press and Rizzoli. A founding partner of SW + SH architecture in Los Angeles, F. Arnold Swanborn has practiced in the Los Angeles area for over 18 years. With a clear contemporary design approach, he has created a vast portolio of successful and innovative projects for buildings of varying types and scales. This work includes a number of single family residences, multifamily housing, healthcare, education and institutional projects. Arnold started his professional career working with renowned Los Angeles firm of Lehrer Architects. Prior to SW + SH, Mr. Swanborn, as a Senior Associate, applied his expertise to institutional and multi-family projects with Johnson Fain Partners. His work has received numerous awards and been published widely. Including the design for Metropolitan Lofts in Downtown Los Angeles, which is seen as a pivotal project in the redevelopment of the Downtown area. His body of work is grounded in the Southern California modern traditions and reaches to different places such as Texas and as far away as China.